It was sterling silver day for JM on 24.11.16 and the first kit of the show included 4mm round Swarovsky crystals, black spinel, purple amethyst and some cute sterling silver star charms and faceted sterling silver beads. There was also a silver plated findings kit and S-Lon cord in all 3 sizes. It would be easy to substitute these materials for something similar. To watch the show click here. The demonstration for this kit starts at around 1 hour 15 into the show. This was demonstrated in the show. First make the braid. Cut 7 x 1m and 1 length measuring 1.2m. Tie all the cords together in an overhand knot and position the cords on the disk on either side of the dots. The braid structure is Round Braid. Braid for 14cm. Braid in the beads, adding in a bead every time the longest cord is moved. When the piece of paper is reached, braid for 1cm without beads. Rip away the paper and braid in the rest of the beads. Braid without beads to match the unbeaded section at the beginning of the braid. Thread the bail onto the braid and finish the ends with end caps and a clasp. Thread the cords through a star charm, centre the charm on the cords and position the cords on the disk on either side of the dots. The braid structure is Round Braid. Braid for 8 individual cord moves. Thread 3 crystals onto all 8 cords. Braid in the beads. A gap will open up in the middle of the braid. Press a crystal into the gap and continue to braid. Press a second crystal into the gap when there is enough space. Remove the braid from the disk. Seal the end of the braid with glue. When dry, trim the braid to fit the end cap. Use strong glue to stick the braid into the end cap and attach it to the bail. The pendant is made using the beadweaving technique of netting. The braid is Half Round Braid. Use 2 cords of 1m length in each slot to make this wide braid. 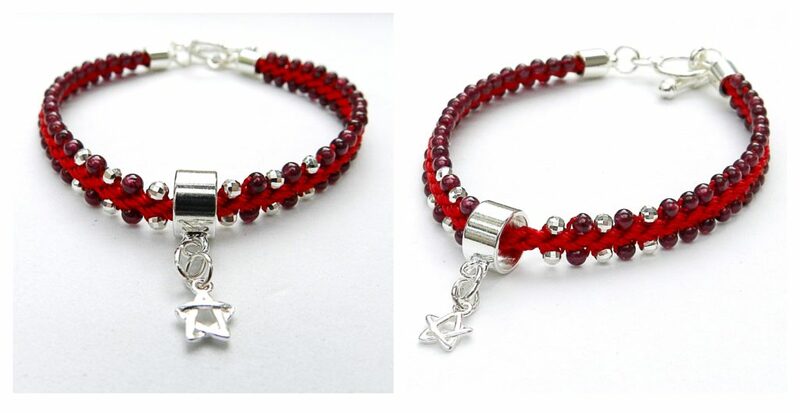 If you have my Prumihimo Disk you will be able to make this elegant bracelet. Braid in the beads until the piece of paper is reached. Braid for 1cm without beads. Rip away the paper and braid in the rest of the beads. 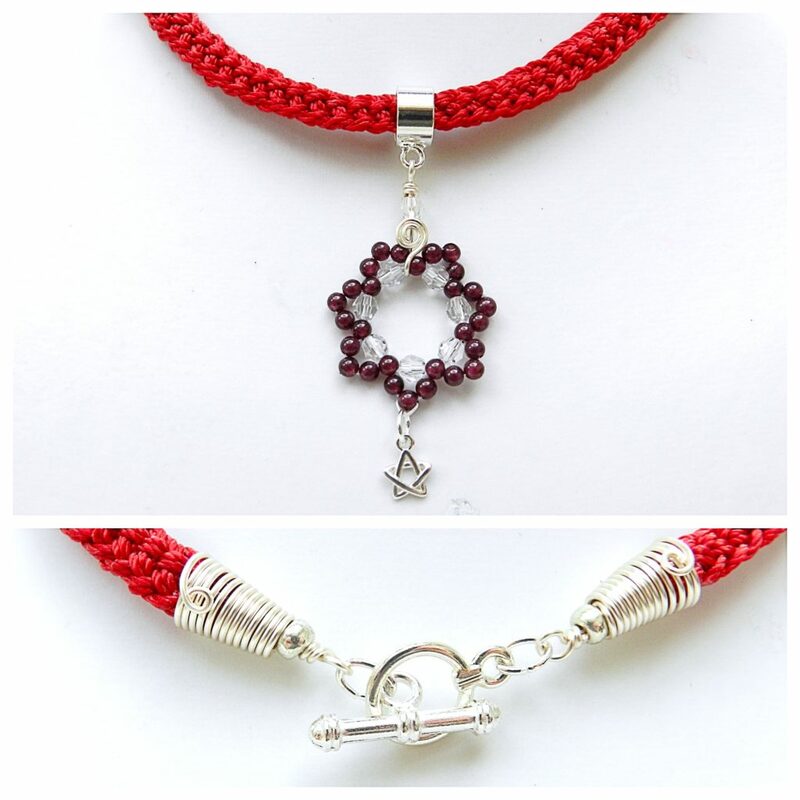 Attach a charm to a bail and thread it onto the braid. Finish off the ends with end caps and a clasp. The black spinel is threaded onto beading wire, crimped at either end and is sewn onto the two kumihimo braids. The braid structure is Round Braid. 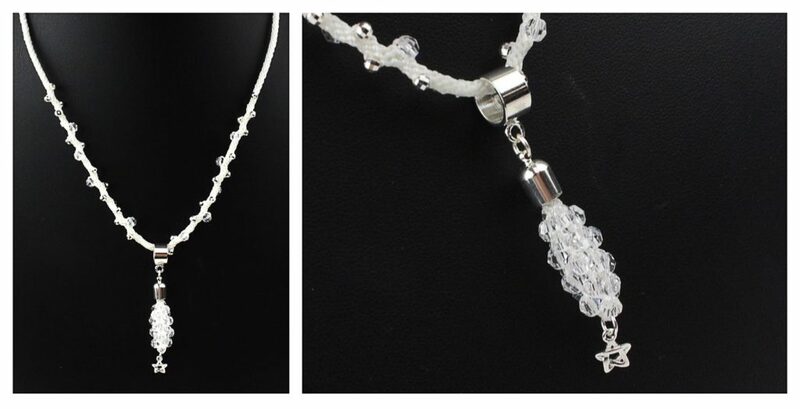 Use S-Lon 0.9mm to enhance and add colour to a simple chain. To secure the cord, knot it around the clasp, trim the ends and melt away the excess with a thread burner or flame. 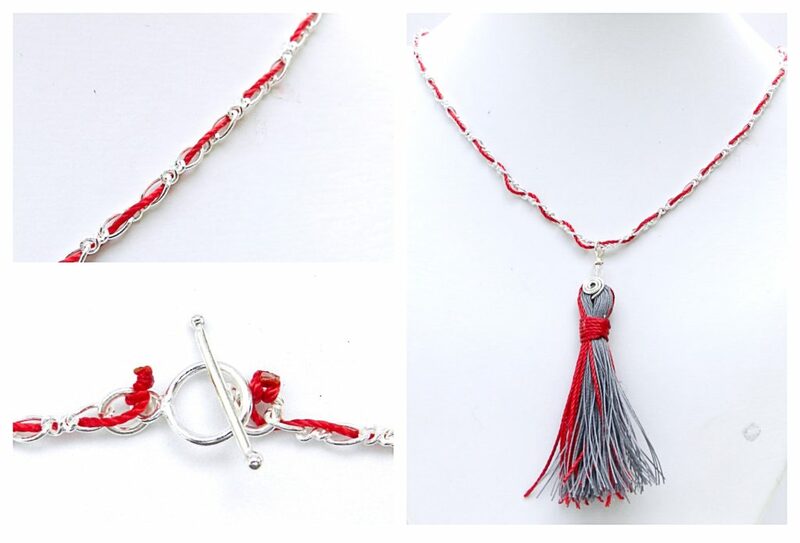 Use 0.3mm and 0.9mm S-Lon cord to make a tassel and attach it to the necklace with a coil and a wrapped loop.